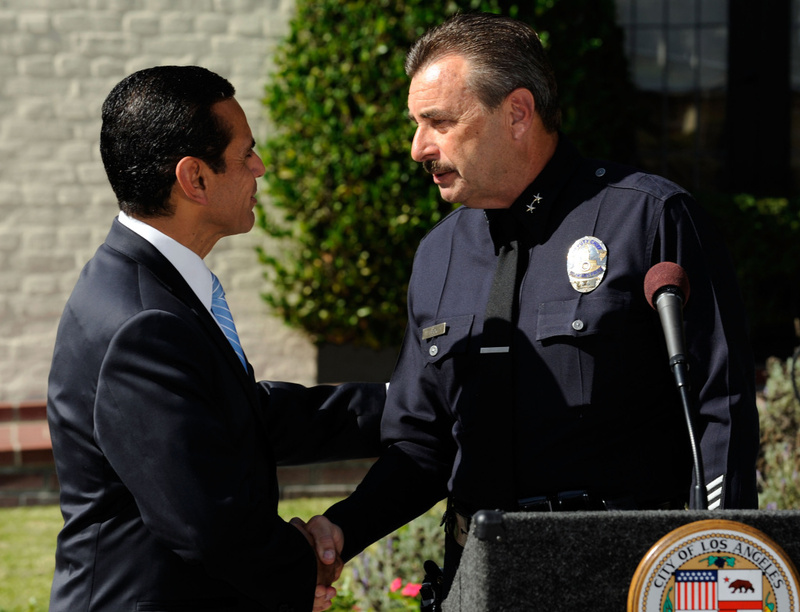 Los Angeles Mayor Antonio Villaraigosa (L) congratulates Los Angeles Police Department Deputy Chief Charles Beck after he was announced as the mayor's selection to be the new Chief of Police at a news conference at the Getty House, the official residence of the mayor, on Nov. 3, 2009 in Los Angeles. Crime in Los Angeles dropped in the first three months of this year, with violent crimes dropping by half over the past eight years, top city officials said Friday. The new statistics follow a trend that Police Chief Charlie Beck and departing Mayor Antonio Villaraigosa attribute to the increased number of police officers since 2005 and an emphasis on community policing and gang prevention programs. 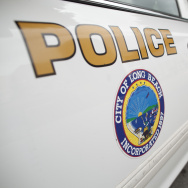 "[The] crime rate is at a record low because the police force is at a record high," said Villaraigosa, who joined Beck at a news conference to announce 2013's first-quarter crime rate figures. 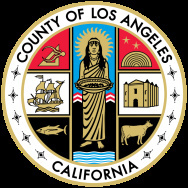 The numbers released Friday also compared the first quarter of this year to a three-month period just prior to when Villaraigosa first took office in July 2005, with Beck underscoring the mayor's role in reducing the crime rate in Los Angeles. "This is a mayor whose commitment to public safety, whose vision created the GRYD [Gang Reduction and Youth Development] office, whose understanding of the world, of Los Angeles, has cut violent crime, gang crime and homicides in half since he became mayor," Beck said. In the most dramatic figure, gang-related homicides took a 66.7 percent dive over the past eight years since Villaraigosa took office, a sign of progress Beck attributed to the "recognition that violence in Los Angeles is gang violence, which is why we focus on gang crime so heavily." Villaraigosa also touted the dramatic reduction in gang-related crimes as an achievement of his time in office, with the new numbers showing gang-related crimes took a 55.3 percent dip since 2005. Citywide violent and property crimes dropped 33.9 percent in that same period. After voters rejected Proposition A in the March 5 primary election, a ballot measure that would have raised the sales tax by 0.5 percent, city leaders warned the police department could be among the target for cuts as city leaders look for ways to solve a $150 million to $165 million budget deficit. 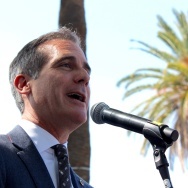 But while Villaraigosa said the police department would not be treated as a "sacred cow," he nevertheless urged Eric Garcetti and Wendy Greuel — the mayoral candidates vying to succeed him — to commit to maintaining police ranks at 10,000 officers or more. "If you want to be the mayor of Los Angeles, then you're going to have to continue to hire police at the levels that we have," said Villaraigosa, who will leave office at the end of June. "You're going to have to continue to make sure public safety is our number one priority." In 2005, police officers numbered 9,284. Today, there are just over 10,000 police officers, according to department statistics. Villaraigosa, who promised to increase the police force in 2005, said Friday he is "proud to have achieved that milestone" and that his budget, to be released later this month, will recommend continuing to hire police. "I expect that the next mayor will have the same commitment," he said. "I've had assurances from both candidates that they will, and I hope to hear them speak to that in the course of this campaign." When this quarter's total homicides are compared with 2005, the homicide rate in Los Angeles declined by 49.6 percent, or nearly half, over the past eight years. Beck framed the drop as an "additional 300 people" who are alive and walking the "streets of Los Angeles every year." Rapes, which saw an uptick last year, came down by 39.4 percent to 124 cases, while aggravated assaults dipped by 11.3 percent and robberies by 13.2 percent. The numbers were released for a three-month period in which the police department collaborated on the massive manhunt of ex-LAPD officer Christopher Dorner that targeted and killed law enforcement and their family members. 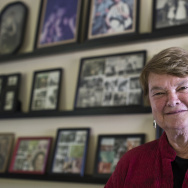 Can LA's gang reduction strategy be exported to Latin America?